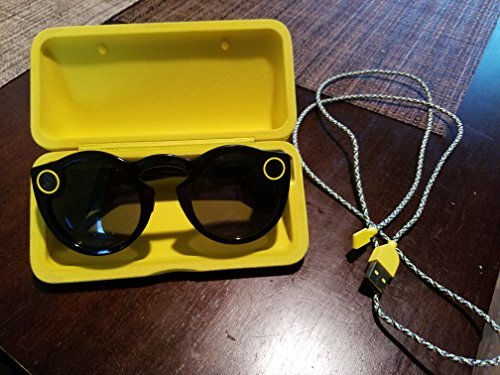 Snapchat Spectacles Sunglasses - three colors: coral, black, and teal! Spectacles are sunglasses that can Snap! With them, you can capture every moment from your perspective, without having a phone getting in the way between you and the world. The specs basics Spectacles are one-size-fits-most! Spectacles record 10-second video Snaps The LED ring on the front will light up when they're recording! Every Snap can be extended twice, giving you a full 30 seconds of video! In Memories, your recording will be broken up into 3 ten-second Snaps. Press and hold the button on Specs to stop recording at any time Specs only record video, capturing memories the same way you experienced them - in motion! When watching Snaps recorded on your Specs, rotate your screen to get a bigger picture Specs can capture about 100 ten-seconds Snaps on each charge. The Specs charging case holds about four charges, so you can stay powered up while on the go Once you've paired Specs with your device, Snaps that you take with Specs will import to Snapchat automatically when you have the app open and your Specs are nearby. You can find all these Snaps in your Memories. If you have any questions about this product by Spectacles, contact us by completing and submitting the form below. If you are looking for a specif part number, please include it with your message.